Nora, my almost 3 year old has been sleeping in a twin bed since she was about 16 or 17 months. 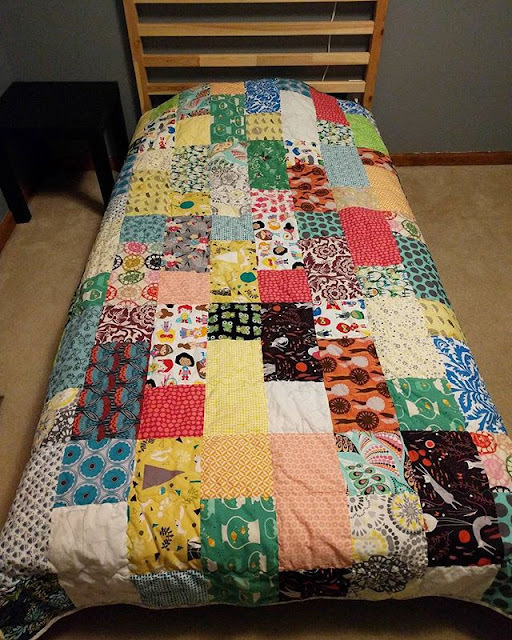 I had every intention to make a twin quilt for her bed pretty quickly. Well we know how life goes, I started on other projects mainly operation handmade Christmas, all the while pregnant with #2. So I never got around to making her own quilt until about a month ago. I finally decided it was time. I was able to pull all of the fabric from my stash (yeah for stash busting!) including the flannel backing. I chose a nice mix of novelty prints along with some of my favorite prints as well. To say Nora was excited about her own quilt is a bit of an understatement. This girl loves quilts and usually is under one in our family room playing or watching a movie (silly girl). She loves pointing out her favorite fabric, it just makes my heart sing. Plus I love tucking her in at naptime and bedtime under a quilt of her very own. Now if I can just finish my a bed quilt for my husband and I, we will all have bed quilts of our own. Thank you, she does love fabric and helping mom. Isn't that the way - a quilter is usually the last to get a quilt for herself. For years we had a single bed quilt on our double bed, before I got around to stitching a much larger one for myself. It's wonderful that your little girl now has her very own quilt on her big bed!